In the past whenever I needed to shorten a long URL I would simply go to tinyurl.com. Tinyurl worked as advertised and made my long URL's tiny, allowing for teachers, students, and parents to type the shortened web address into their browser of choice. Well it just so happens that there exists a site that offers so much more in the realm of custom URL shortening. Tiny.cc is a simple, yet powerful URL shortening site. The beauty of this site would be the fact that just like tinyurl it allows for me to easily create a shortened, fully customized, URL. 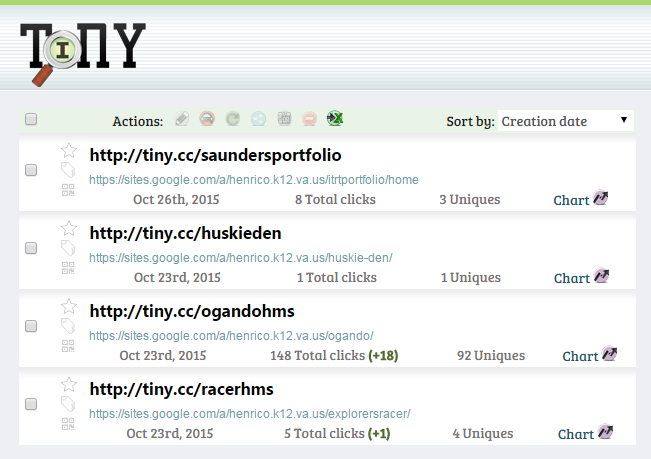 However, unlike tinyurl it allows the user to do so much more! This truly awesome site gives me the option to manage and update saved URLs at a later date. For example, whenever the urge strikes I can update the name of the customized URL, delete a shortened URL that I am no longer using, attach specific tags to a URL, view site statistics, and create QR codes on the fly. The free version allows for up to 1000 free shortened URLs which is more than enough to meet my everyday needs. The example below shows how I was able to update this long Google site address - https://sites.google.com/a/henrico.k12.va.us/explorersracer/ and shorten it to - tiny.cc/racerhms. Once you shorten a URL it remains that way permanently. It will never expire unless you make changes to the link at a later date using the previously discussed manage option. Clicking manage allows you to edit, view stats, create tags & QR Codes, and export links to an excel spreadsheet.